AMC Trails Blog: Eight Women and Two Men Tackle Dorr Mtn. Eight Women and Two Men Tackle Dorr Mtn. Hardening trail that was being rebuilt by the Park Service along with crushing rock, transplanting vegetation and highlining rocks both up the mountain and down to a work site from a quarry were all part of the activities undertaken by the AMC’s trail crew. Great weather, well almost.On day two we found ourselves working at a lower elevation on the ADA Trail because of severe lightning and heavy rains. We did drainage work. 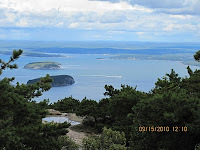 On Wednesday and Thursday we returned to the work site on Dorr Mountain, one mile and over 700 feet above the trail head. 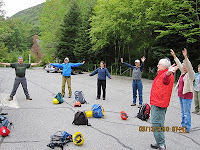 (Joanie, Eva, Colleen, Becky, Gerry, Valrie, Cheryl) and Joe quickly became an effective team in camp and on the trail. In camp we ate well, did our chores, slept well (cool nights and hard work) and had a wonderful birthday party one night. 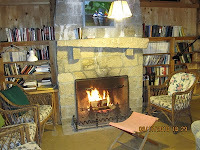 The fireplace in the library became the focal point for evening conversation. 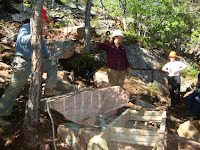 At the work site the crew quickly learned the skills needed to do the work which supported the Park Service Crew. Everyone worked efficiently and the group was as effective as any crew I have ever worked with.